Free ERD Commander Download for Windows XP – (30 day Trial Version): Follow the instructions below to remove the 30 day time-limit using a utility supplied with the trial version. This gives you a full, free working version of ERD Commander for Windows XP with no time-limit! 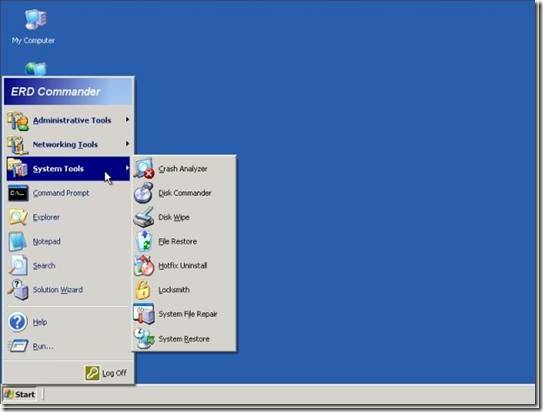 ERD Commander was orginally available as Winternals ERD Commander 2005 – part of the Winternals Admin Pack. But since Winternals was bought by Microsoft in 2006, ERD Commander is no longer an over-the-counter product available to the general public. ERD Commander is a very powerful tool. It comes in the form of an ERD Commander ISO file which is burned to a CD which is a diagnostic and recovery boot disk for Windows XP. This is one of the most useful PC diagnostic tools I have ever used. Microsoft DaRT (MSDaRT50Eval.msi) is a 30 day evaluation version of ERD Commander, but it also contains a utility which can be used to extend the evaluation period to whatever is desired. 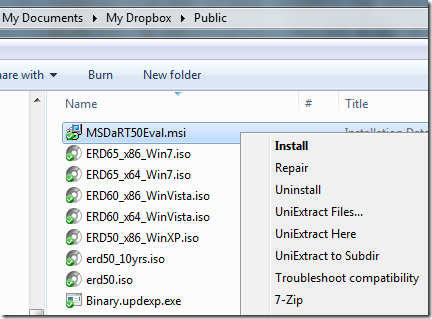 The Microsoft Diagnostics and Recovery Toolset (DaRT ) downloads as a file – MSDaRT50Eval.msi which contains a 30 day trial version of ERD Commander 2007. Burning another Wndows boot disk CD will make no difference, as the time limitation is encoded into the erd50.iso file. During the installation process a time limit of 30 days from the date of installation is encoded into the erd50.iso file, so even if you try to create another windows recovery cd from the erd50.iso, the encoded time limit will still commence from the date of original installation. I am not sure if uninstalling MSDaRT50Eval.msi and subsequently reinstalling it will create a new erd50.iso with a 30 day limit that runs from the subsequent installation date, but I suspect that it will still run from the date of first installation. However, Microsoft included in the installation package a file – Binary.updexp which can be used to extend the 30 day time limit. We can use the above instructions to extend the 30 day evaluation period to however long we choose. For this we need the installation file which contains the erd50.iso file, Universal Extractor software to extract Binary.updexp.exe with which we extend the time limit, and some ISO recording software, to burn the modified erd50.iso to a blank CD. Select MSI Administrative Installer and press OK.
Current time in file is …. New time will be 36135 day(s) from now. Note: this should only be used on Windows XP 32 bit systems. I have successfully used it on Vista 32 bit to reset passwords – but it wipes off all the System Restore points. If you can live with that you can still use it to do other things, like move precious files off your hard drive onto a USB memory key…. ‘UpdateExp.exe’ is not recognised as an internal or external command, operable program or batch file. its really work very gud…. hurray!!! it works thanks a lot. what about when admin passworded then also erd will work or not? Your article has been of good use for everyone! keep doing the good work and more power! Could you also include a guide for ERD 2010? will this utility get around an encrypted win/XP operating system? if so, how is it done? You guys are awesome, thank you very much. If your OS doesn’t show up it may well be that the installation is too badly damaged. You can only use ERD to attach to an installation that is still largely intact. Not being able to attach to an installation sometimes happens when the drive is failing or has failed. If you can boot into the system without attaching to the OS and can see files using ERD’s Windows Explorer, you should be able to recover data – see http://calmit.org/recover-files-dead-dying-pc/. But if you can’t see anything – then it is likely that the drive has failed or is badly damaged. If this is the case you may need to contact a data recovery company. I use http://www.maindisc.co.uk/ for this kind of situation – contact Stephen Warrener – they are very good and a lot cheaper than most. as written the article makes no sense, and it’s instructions are impossible to follow. I’m sure I can muddle through it anyway but it’s quite unhelpful. Hi Warkirby, thanks for pointing out the bits you found confusing. I have tweaked them so that it’s easier to follow. WarKirby, that has to be the biggest troll post ever. Learn to read. It was clear enough that my girlfriend (who barely knows anything except point and click) could do this. You just need to follow instructions and stop asking what everything means. You clearly know enough (I read your post) about what things should do, so go make your own if you want structure and grammar. Thank you Alan for this great post. My girlfriend was able to transfer her data with very little help. Thanks Gord – glad it works for you and your girlfriend. Maybe WarKirby has a point – the article needs tidying up, but if he had tried it, rather than getting stuck in fault-finding mode, he’d have found that it does in fact work! thanks for your effort in creating them and care in tweaking them. does this work for Windows 7 64 bit? ERROR: Windows Installer can’t opne this installation package. Try extracting it with 7Zip instead – download from http://www.7Zip.org. 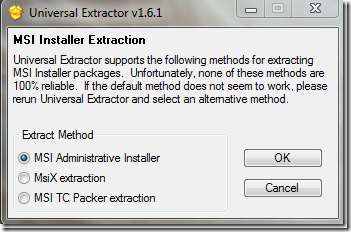 Install and then right click and go to 7Zip–> Extract Files. That should do it. By the way you say that the sftware validity will be only 30 days when the sftware is installed (not extracted) . so, if we extract the file, it will not be installed. So, there is no validity for the erd50.iso file. So, what happens if we burn the erd50.iso file directly to the (Compact Disc) after we extract????? HELP ME.. Try it on a different PC. I haven’t had the chance to test this on that many system configurations. If it doesn’t work on your own PC, try it on a friend’s PC – it should work on a Windows XP system. Regarding your other question – the internal date of the extracted erd50.iso file is set to 05/14/2007 so if you extract it and burn it directly to CD, you won’t be able to boot, as it will say it has already expired. During the installation process the internal expiry date is reset to the date you installed it plus 30 days. However, you could try advancing the date on your PC by 10 years, then installing from MSDaRT50Eval.msi, then burning the CD. You won’t know for 30 days if you have been able to exceed the time limit (I suspect this might work). The nice thing about the method described in the article above, is that you get the confirmation message – the utility is designed to reset the date, and you can see that it has happened. 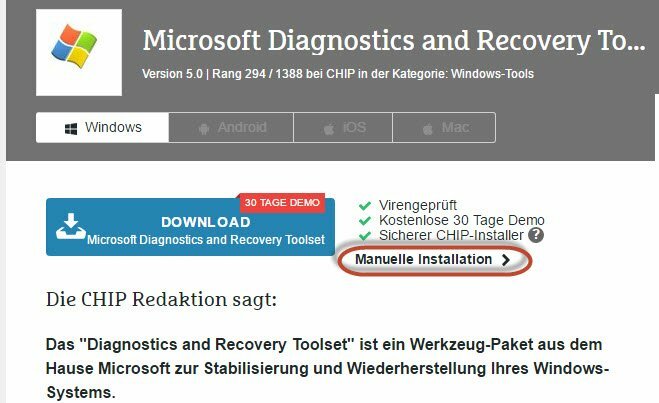 The chip.de IS working – I checked several times. I have improved the instructions in the article above. Try it again. You’ll need a working XP machine – borrow a friend’s if yours is down. My acer netbook doesnt have a cd drive and it wont let me login to windows, it tries to, but then it logs me right back out. I am downloading this on my dad’s computer and putting the ISO file on a USB drive. I tried to get it to work by booting from the USB on the netbook but it won’t. The USB drive is 16 GB and it has an autorun program. Is there anything I can do to get this program to work without having to burn it to a CD? Jay, if you want to run erd from a usb drive you could try the grub4dos approach. This method will allow you to boot many different iso’s directly from your usb drive. Click refresh on part list and choose whole disk mbr. Grub has now been written to the flash drive mbr. Now copy grldr and menu.lst from dos4grub over to the flash drive. Your flash drive will now be ready to add files to boot from. Copy erd50.iso and firadisk.img to the ISO folder. Try this http://calmit.org/erd-commander-bootable-usb-flash-drive/. This method of creating a Bootable ERD Commander USB Flash Drive works really well. Follow your steps, I could do it ! Alan, Thanks a lot! sweet tool… thanks so much!! Easy way to remove the time trial. Extract the erd iso or simply open with an iso reading tool such as MagicIso. Locate the file winpeshl.ini in the system32 directory. Set EOT To EOT=fffffffffffffff and save. Recompile image. For anyone who can’t see their OS using this tool, it’s probably due to a missing sata controller driver. All you need to do is find out which sata controller your computer has, download the driver and put it on a floppy. Whilst booting erd you will get a chance to load the driver by pressing F6 when indicated. If you haven’t got a floopy drive you will need to add the driver directly to erd. Just copy the driver to the system32\driver directory and edit txtsetup.sif. A quick google search will explain how to do this. I try to boot it from USB drive. However, when the select the usb of 1st boot device and restart PC, an error has occured which is “remove disk or media drive. Press any key to restart”. I think this error caused by a problem with creating bootable USB drive. can you help me to create USB bootable version of ERD Commander. What is this exactly for and how to get for Windows 7 x64, please? Alan you just saved the day for me with this. As I’m sure is the case for many people. Much appreciated 🙂 (P.S. For updating the erd50.iso file expiry date I had problems at first in Vista 32 bit version. But running cmd as administrator solved the problem). Hi Peter, glad it worked. I’ve added a bit to the article to make it clearer. Thanks for great post! This worked great with a CD, but every time I use a bootable USB, it blue screens. I follwed the instructions in your other post about using Yumi. I get past the ERD loading screen and then it blue screens after the Windows logo screen. Any ideas? I would suggest you try a different USB Flash Drive. 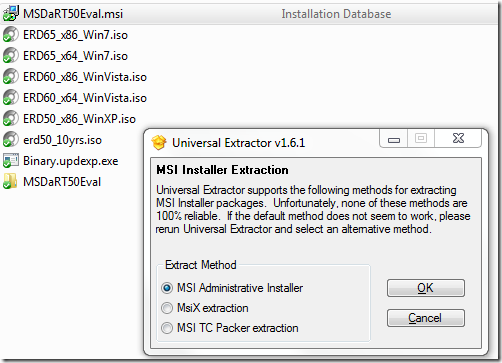 Used MSDaRT50Eval.msi (without installing), Universal Extractor and extended expiration date as above said. Then used ImgBrn to make CD. How to go about this error? Whould it make a difference if I first install the msi?